then the endocrine system kicks in for the longer haul as needed. The endocrine system is imbalanced when we experience depression, anxiety, mood swings, ADD, ADHD, weight gain, low libido, insomnia, fatigue, heart racing/palpitations, cravings for specific foods or drinks, swings in body temperature, poor memory/concentration. So consult that document for those problems. 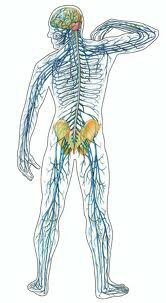 The nervous system imbalances result in problems with motor control (twitches, tics, paralysis), sensory impairment or imbalances (some kinds of numbness, ‘creepy crawly’ sensations, pain) and some kinds of organ dysfunction (due to faulty signaling). The imbalances are created by chronic stress, trauma, or medical intervention (drugs, vaccinations, surgery, and radiation), or, in sensitive individuals, EMF effects. The latter producing an inability to calm down. If you experience agitation, ‘failure to calm’, and sleep problems, consult with the diode post and the grounding post. Stroke. Here an interruption in blood supply has occurred either due to a clot or to a bleed out/rupture. The development of clots is discussed in the Blood Supply doc (1D4). The bleed out etiology is also discussed here. One can completely recover from these as long as they were not medically induced (see personal FAQs for my husband’s experience). In case of a clot, a well stocked liver will begin making its own clot-dissolvers and raise the blood pressure to make sure they are delivered to the brain site. Aiding and abetting the body’s effort would be Ginkgo Hawthorne (#909-3) 3B, 3D, and Butcher’s Broom (#135-5) 2B, 2D. Add Adrenal Support (#1507-0) 2B, 2D to address the stress damage. To Address the Stress, aka the root cause, visit that doc. A bleed out results from weak vasculars usually weakened by inflammation. Cholesterol is a vascular anti-inflammatory which prevents these kinds of events if available in sufficient levels. Harbingers of this scenario include easy bruising, spider veins and varicose veins (or blood thinners from the doc). To fortify the vasculars take Varigone (#999-9) 2B, 2D and Bilberry (#74-8) 2B, 2D. Shingles. Shingles develops on the damaged nerve sheath. It is a repair program. To bring it to conclusion, first, come to terms with what is stressing you, (no really, you’ll heal faster), and, second, encourage the nerve repair process. Some approaches incorporate lots of natural ‘anti-virals’ (such as Chinese Concentrated VS-C (#949-2), l-Lysine (#1631-4), Elderberry (#868-5)) which are mostly helpful in the early aspects of the disease where there may be flu-like symptoms, to address the terrain. But the problem is not the virus but the broken down nerve sheath. Acid buildup from stress creates the fiery pain in the nerves. The cause is from ‘too-muchness’, so this basic cause needs to be addressed as outlined in #1 [special sub case] in the Pain page. The pain from shingles can last years, if the nerve sheaths aren’t repaired. To move on from adjusting the terrain we should offer the body some nerve food. To repair the stress-damaged nerves take internally St John’s Wort (#655-3) 3B, 3D, Nerve Control (#1242-4) 3B, 3D and Stress-J (#1084-1)3B, 3D. Reduce dosage with symptoms (or increase with increased stress). Topically for pain spray on Liquid Capsicum Extract (#1782-0) (You can dump the whole 2 ounces of Liquid Capsicum Extract into a small store-bought bottle that produces a fine spray and spray the extract undiluted onto the area of the lesions. With capsicum which is red pepper be careful to wash your hands or not touch your mouth or eyes with it. The capsicum will not damage tissue but can hurt like the dickens.) OR, apply with your finger some Liquid Oregon Grape (#3395-9), which tends to stick better to the lesions area. The pain comes from around the lesion, not the exact spot of the lesion. Reduce application with relief. Relief comes rather quickly once the underlying nerves begin to respond If you are currently taking an SSRI-type anti-depressant some say you shouldn’t take St. John’s Wort. Bell’s Palsy. Like Shingles it is a result of damage to the nerves that control the muscles of the face. But unlike shingles the nerve signaling is affected by lowered circulation to the nerves servicing the face due to either vascular damage or muscle tension. The situations that impair blood supply are in that document. In this way Bell’s Palsy resembles a stroke which is also the result of impaired blood flow to nervous tissue. Anti-oxidants can help reduce vascular inflammation, thus improve circulation. Blood Pressurex (#554-8) aides vascular repair and Nutri-Calm (#4803-3) relaxes muscles and vasculars supplying the area of the damaged nerves to effect a quick repair. And as the case in damaged nerves, you must address the stress. For radiation damage to the nerves, see the remedies discussed in the ‘Specific Imbalances’ section of the Skin document. The Korean Ginseng (#665-4) and Green Tea (#1096-6) therapy can be continued until the radiation inflammation is resolved. Begin with the recommended dosage and follow Basic Principle #9 to determine dosage. This can resolve inside a month with the higher dosages. When the inflammation (pain/tenderness) subsides then rebuild with Nerve Control (#1242-4) 3B, 3D for 1-2 bottles. However I have seen cases where important tissue was cooked beyond recovery, unfortunately. For surgical damage to the nerves, begin to rebuild with Nerve Control (#1242-4) 3B, 3D for 1-2 bottles. Then see the remedies discussed in the ‘Specific Imbalances’ section of the Skin document for how to address the scarring. For chemical damage to the nerves from drugs or vaccinations, there is no one size fits all. It is a helpless feeling to watch someone die of morphine or valium as their nervous system just shuts down. Or to see healthy and fit military folks be saddled with mysterious dysfunctions for the rest of their life – fortunately these are reversible. (Please have any vets that you know with this situation contact me or read through this website.) Many kinds of chemical exposures affect the nervous system including artificial sweeteners which toxicity mimics many neurological disorders. To introduce some protection from these substances which tend to stay in the body a long time, consider HP Grapine (#1699-3) 3B, 3D for a week then 2B, 2D for 2 months. Add N-Acetyl Cysteine (#509-7) 2B to protect and provide ingredients to detox the liver. And consider the Gentle Liver Cleanse. If you have a mysterious neurological manifestation, know it is reversible to some degree and make an appointment. This was where I began my search for ‘something natural’. Memory problems arise from a number of imbalances the major ones being (1) glucose dysregulation and (2) blood flow impairment and in the worst cases, both! Although we tend to poke fun at our ‘senior moments’ it is best to address this problem vigorously. If the general suggestions made below do not greatly improve the situation, make an appointment. If your blood type is O and you have diabetes in your family, memory issues most likely arise from blood sugar regulation issues. If your brain runs on glucose then your body’s inability to regulate glucose can eventually lead to serious dementia/Alzheimer’s. To address this imbalance, read the document on Dysglycemia to see if any of these scenarios apply to you. (I have seen aggressive medical treatment of pre-diabetic conditions result in memory and behavior problems and anxiety in otherwise happy humans because of the resultant lowered blood glucose levels to the brain.) This blood type should follow their blood-type diet and the Insulin Resistance diet and train their brain to work on keto acids by doing the Atkin’s diet or some version of a ketogenic diet. If your blood type is A or you are a very stressed blood type O (with no dysglycemia), the memory issues most likely arise from blood supply to the brain. That document will give you other clues if this is the underlying imbalance. Blood pressure medications also impair the delivery of nutrients to the brain and do not address the underlying cause anyway. So these can cause dangerous brain function impairment. My clients have shown me that there is a vulnerability to these developments with impaired liver function. Stress is often a big factor. The following may be helpful: Target Endurance (#2809-8) 4B, 4D and Nerve Control (#1242-4) 3B, 3D. These may need to change as healing progresses so it is best to make an appointment. It is important to know that our stressful thoughts activate OR inhibit certain nerve impulses and glandular secretions that in turn activate OR inhibit organ response and function. Address the Stress post gives protocols for reducing the damage done. Dr. Hamer, a German oncologist, and founder of The German New Medicine, demonstrated that unexpected trauma creates ring-like features on the brain that are visible with a CAT scan. After studying more than 40,000 case studies spanning more than 30 years he can predict from a CAT scan of the brain the nature of the trauma and what manifestations (diseases) to expect in the body from the trauma. His results provide hard evidence of the effects of trauma/stress on the nerve tissue of the physical body. In German New Medicine the therapy begins with resolving the trauma (similar to the process discussed in my book) and then preparing the patient for the various disease manifestations that result as the trauma is flushed out of the body’s tissues aka disease. Of interest is his assertion that there is no such thing as a brain tumor. What appears as a brain tumor is actually an accumulation of glia (cerebral connective tissue) that appears as a mass during the healing process. It is this harmless glia accumulation that is commonly called a brain tumor, even though it is actually healing a brain lesion. Dr. Hamer established in 1982 the link between these “brain tumors” and simultaneous disease manifestations on the corresponding organs. ElectroMedicine devices have demonstrated great promise is resolving imbalances registering on the brain and nerve tissue. That document lists many. New research has reported a very strong link between Parkinson’s disease and Statin use (Reuters. 1.15.07). At the University of North Carolina, researchers found a 350% increase risk of Parkinson’s in those with low LDL’s versus those with higher LDL levels. Further research is being done to confirm or refute this link. One of the side effects of statins is brain fog. I have a horrid reaction to poison ivy. Please tell me what you think of these items: Tei Fu for itchies; Nature’s Fresh for skin conditioning; MSM for inflammation; silver gel for healing. What about extracting the ‘poison’? It was a very hot day and it seems to have soaked into my pores and become systemic. I can tell you have been busy with the website. It looks great. Lots MSM, and topically use Distress Remedy and Silver Gel – alternate. AdaptoMax helps with turning the corner quickly 3B, 3D. I have been on Pamelor, Klonopin, and Neurontin for many years, extremely small doses by medical standards. Just stopped Klonopin a few months ago which caused a severe stress reaction. Now I have scary headaches and very scary memory issues. Have also lived in major stress for many years. Just lost job which was primary source of stress… so maybe now can heal? I’m very concerned about Alzheimer’s. Of course you can heal. It is a process that is built in. You may want to consider a phone/email consult, because a lot more data will be helpful in determining a course of treatment. I come to you recommended by my sister Terri Baumann. My problem is my husband’s declining mental condition. He has been diagnosed with early onset Alzheimers . He is 60 and has been healthy as a horse his entire life. Very athletic in his younger years and hardly a cold or other sickness EVER! Never taken any meds. He started exhibiting memory issues and some confusion about 18 months ago. It has taken me this long to get him to a doctor. We will be visiting the USF BYRD Institute for Alz in May. I have him on the MInd Max and it def helps with his confusion. I still see some symptoms though. Any thoughts on other natural remedies? Thank you so much for any info you may be able to provide. Be very careful of any medical intervention. Please read this especially the last section and take notes before you go. Pat – I had a shingles outbreak above and in my left eye a few years back. Didn’t know what it was at first (had no pain) but when vision became blurred I went to eye doctor and was diagnosed and prescribed steroid eye drops. The symptoms cleared up, but now reading your post I am concerned that the condition is laying dormant and could resurface. Any time my eye turns red for any reason I get concerned. I would like to resolve it. What should be my first steps? I have found that overwhelming stress is a major contributor in a shingles outbreak. Whenever steroids work, Grapine HP seems to work as well but high doses are needed 3B, 3D. Topically, when the eye turns red I would spray Silver Shield mist into the eye using the type of applicator shown here. If they appear on other parts of the body, liquid Oregon Grape helps with the symptoms. You can work on healing the nerves with the herbs I mention in this post for shingles. You don’t need to do them all at once but maybe rotate them and notice which produce the best effects. Your website was recommended to me just yesterday form a nurse that assisted me with a colonoscopy. She must have overheard me talking about the possibility of my having a yeast overgrowth in my intestine. I have researched the problem and feel that this cold be a reason for my recent Fibromyalgia flare-ups, specifically related to my intestine not processing foods like it should. I haven’t found any information on you site about Fibromyalgia. I haven’t had the chance to read all of your information, because it is very extensive to do at one sitting at the computer, but I will continue to search. Do you have any input for me? My thoughts on yeast infections are found here and here. I don’t have a post on fibromyalgia per se because addressing the underlying causes (like fatigue) and using the principles in the above posts usually causes it to slip into remision. His symptoms can be caused simply by swelling or blood sugar related issues. A ketogenic diet would help prevent such things. Please enter ‘fibromyalgia’ in the search box on the upper right of the page and you’ll see several posts where I discuss that topic.